It is impossible to overstate the debt we owe to the late Richard Itter and his Lyrita record label for promoting and, in many cases, reviving British music. 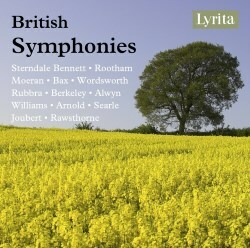 This four-disc set is devoted to British symphonies mostly written in the first half of the 20th century, nearly all of which have been totally ignored both by the major record labels and concert promoters both at home and abroad. The recurrent question posed by delving back into the Lyrita archives is, why did this music never catch on? Is there some fundamental flaw in British music which renders it unpalatable to the wider musical public, or is it just a bias against anything British? My old university tutor, thoroughly imbued in the dreadful Tovey-esque conviction that the only truly great music originated from the Germanic states, responded when we played him, blind, a recording of Sullivan’s Irish Symphony; “If I didn’t know better, I’d say it was by Brahms on a particularly good day”. From him that was lavish praise, but when he learnt who the composer was, he started to backtrack. Having listened, now several times over, to these 13 symphonies back-to-back I remain mystified. They are not great works, but they are very fine ones and deserve far more respect and attention than they currently receive. Why is not the dramatically gushing opening of Cyril Rootham’s C minor Symphony more frequently heard today, or the dark menace of Bax’s First (powerfully evoked here by Myer Fredman in one of his most masterly recordings) not high up on every music-lover’s playlist? Listening to them also prompts me to ask myself whether there is anything particularly distinctive about the British symphony as a genre. Perhaps the great heritage of British folk music is revealed in a wealth of fine melodies and, more particularly, in a sense of rhythmic vitality which does inform every one of these works to a greater or lesser extent. Beyond that there is nothing specifically British about this music; although at the same time none of this music could be seriously mistaken for the work of a German, French, Italian or even a Russian composer. Perhaps the one exception to that is the only 19th century work here, William Sterndale Bennett’s Symphony in G minor which was written between 1864 and 1867. The first movement is clearly influenced by Mendelssohn, and is so fluent and sophisticated in its musical language, that one can readily understand why Mendelssohn held Bennett in such high regard. However, with the second movement, we delve into a world of complex and highly original rhythmic ideas about as far as you could get from the bubbling Mendelssohn scherzo. For all its superficial nods towards the world of Mendelssohn, this is a highly original and distinctive symphony, distinguished by a command of orchestration which goes way beyond what many other composers of the day were putting into symphonies. Perhaps the fact that it is exactly contemporaneous with Brahms 1 led to its being eclipsed by the German work; if so the time has certainly come for a re-appraisal. It is always tempting when listening to symphonies by largely neglected composers to play the game of spot-the-influence. Certainly, beyond Mendelssohn and Bennett one hears distinct echoes of Sibelius in the stark first movement of Rubbra’s Fourth Symphony, hints of Prokofiev in the mischievous opening to William Wordsworth’s Third, and more than a whiff of Shostakovich in Grace Williams’s Second. It is a matter of deep personal embarrassment that, despite having spent much of my early professional life as a musician and critic living and working in Wales, this was the first time I had encountered the Grace Williams Symphony. What an extraordinarily accomplished and compelling work this is, greatly supported by a top-notch performance from the former BBC Welsh Symphony Orchestra under that marvellous champion of British music, Vernon Handley. This set also includes what must have been one of Handley’s last ever studio recordings, the Symphony No.1 by John Joubert with the LPO. Joubert is not only the sole living composer represented here, he is also the only non-British one; although since settling in the UK from his native South Africa after the Second World War he has become so thoroughly associated with British music that we should have no hesitation in claiming him as one of our own. For generations brought up on the miniature marvels of his lovely carol setting “There is no Rose”, the angular austerity of the somewhat pointillist first movement will come as a surprise; although I hope a very welcome one for this a very absorbing and action-packed work, full of colour and ingenious orchestral texture. The recordings range over a 40 year period and, in the main, have come up exceptionally well on CD. A few blemishes in the original tapes have not been completely expunged from the Boult recording of Moeran’s Sinfonietta but this is such a valuable and welcome inclusion that we can easily overlook these tiny flaws. My initial disappointment that the Moeran listed on the cover was not the G minor Symphony conducted by Boult with the New Philharmonia Orchestra which has been described as “one of the finest jewels in the Lyrita catalogue” but the less well known Sinfonietta, was quickly dispelled by this endearing performance full of energy and warmth, reminding us again how Boult had such a distinctive feel for this music. With concise yet thoroughly researched and informative booklet notes by Paul Conway, this is a very significant release which really deserves to be snapped up by everyone, not least those who still cling to the discredited belief that when it comes to composing symphonies, Britain has always been in the second division.